Conn, Heather. "Romeo Saganash". The Canadian Encyclopedia, 19 September 2018, Historica Canada. https://www.thecanadianencyclopedia.ca/en/article/romeo-saganash. Accessed 22 April 2019. Romeo Saganash, lawyer, politician, advocate for Indigenous rights (born 28 October 1962 in Waswanipi, a Cree community southeast of James Bay in central Quebec). Saganash is Quebec’s first Indigenous Member of Parliament and the province’s first Cree person to receive an undergraduate law degree. He is believed to be the first Indigenous leader in Canada to run for the leadership of a major political party. For the last 20 years, Saganash has represented the Cree at numerous national and international forums concerning Indigenous issues. He spent 23 years helping to negotiate the United Nations Declaration on the Rights of Indigenous Peoples — a resolution that provides a framework to implement treaty rights between First Peoples and Canada and to fulfill other obligations in international agreements. He has spent his life furthering the economic, environmental, legal and constitutional rights of Indigenous peoples in Canada, particularly the Cree in the James Bay region. Romeo Saganash, MP for Abitibi—Baie-James—Nunavik—Eeyou, speaks to students and supporters at l'Université du Québec à Montréal on 26 January 2010. Saganash was the 13th of 14 children born to Mary and William Saganash. The couple also adopted three children. Though they were raised in a traditional Cree home, the Saganash children were eventually sent to different residential schools in Ontario and Quebec . One of the first children taken, Romeo’s other brother Johnnish (“Johnny”), was sent to Moose Factory , Ontario, in 1954. He died there of rheumatic fever a year later. The federal government did not tell his parents that Johnny had died and there was no death certificate. The family did not find out where Johnny was buried—in an unmarked grave near the Moose Factory residential school—until 40 years later, through the efforts of Emma Saganash, Romeo’s journalist sister. Romeo Saganash was sent to residential school in La Tuque at age seven. He lived with an English -speaking Anglican family during his time there. He stayed in La Tuque for 10 years, finishing his high school education in French . Saganash speaks fluent Cree , English and French. Decades later, Saganash shared his painful school experiences at the Truth and Reconciliation Commission hearings in Montreal in 2013. At age 23, Saganash founded the Cree National Youth Council in 1985. He became involved in the economic development of his region, working with businesses such as CreeCo Inc. (Cree Regional Economic Enterprises Company Incorporated) and the James Bay Eeyou Corporation. His attendance at a panel on an anniversary of the 1975 James Bay Agreement sparked his interest in pursuing a law degree. 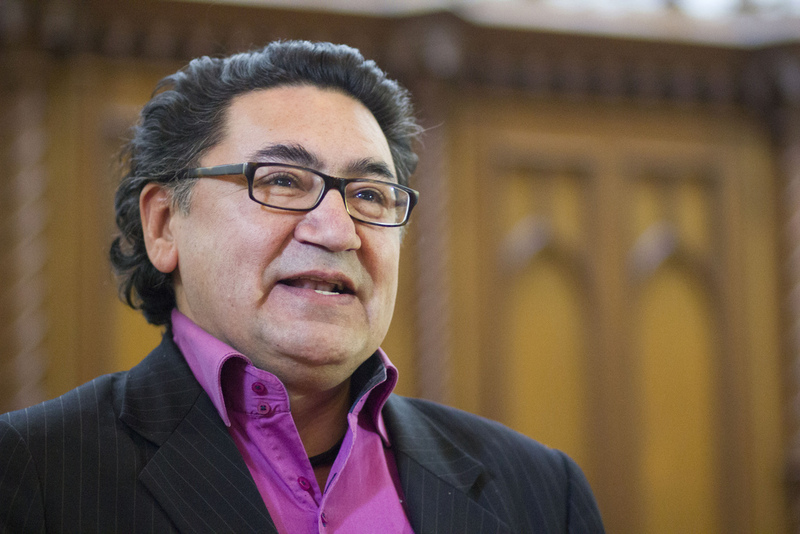 Saganash received his bachelor of law in 1989 from the Université du Québec à Montréal , becoming the first Cree person in the province to obtain this degree. Between 1990 and 1993, Saganash was deputy grand chief of the Grand Council of the Crees (Eeyou Istchee) of James Bay. Later, he served as the Council’s director of Quebec and international relations from 1995-2011. He chaired the James Bay Advisory Committee on the Environment from 1997 to 2000. Saganash was involved in negotiations that led to the signing of the Paix des Braves (Peace of the Brave) agreement on 7 February 2002, between the Quebec government and the Grand Council of the Crees. This document outlines revenue-sharing to be derived until 2052 from mining , hydroelectric development and forestry carried out on the traditional lands of Cree people in Quebec. In 2011, Saganash was elected the New Democratic Party ’s (NDP) Member of Parliament (MP) for Abitibi–Baie-James–Nunavik–Eeyou in northern Quebec, the country’s second largest federal riding after Nunavut . He received personal support from Thomas Mulcair , who went on to be the leader of the party. Muclair called Saganash “a very important candidate” as a prominent and popular Cree person in a riding with many Indigenous	voters. In September 2011, Saganash announced that he was running for the federal NDP leadership, to succeed party head Jack Layton , who died of cancer the previous month. It is believed this made Saganash the first Indigenous leader in Canada to run for the leadership of a major political party. However, he withdrew his candidacy in February 2012, citing family illness and a lack of confidence in his campaign. The following month, he announced that he would support Mulcair as federal NDP leader. Saganash took sick leave in October 2012 to treat alcohol dependency . This was prompted by his removal, due to intoxication, from an Air Canada Jazz flight from Montreal to Val d’Or . He cited the death of friend and mentor Jack Layton and “profound scars” from his childhood woes in the residential school system as reasons for his addiction. After completing his treatment in November 2012, Saganash returned for the start of the first parliamentary session in 2013. He was re-elected to a second term in the 2015 Canadian federal election . Saganash has announced he will not run for a third term in the 2019 election. Saganash has served as the NDP critic for Energy and Natural Resources, International Development, and as deputy critic for Intergovernmental Aboriginal Affairs. Currently, he is the NDP’s critic for reconciliation and for the Canadian Northern Economic Development Agency. On April 21, 2016, Saganash put forth a private member’s bill to ensure that Canada’s laws abide by the United Nations Declaration on the Rights of Indigenous Peoples, adopted in 2007 and fully supported by Canada without qualifications in 2016. The declaration reaffirms the rights of Indigenous peoples as human rights , including the right to self-determination and to “maintain and strengthen” their own political, legal, economic, social and cultural institutions. Saganash wrote in The Tyee in 2016 that the declaration “embodies the most important rights our ancestors have long fought for.” As of July 2018, the bill passed the House and is working its way through the Senate . In May 2018 a motion co-sponsored by Saganash and NDP MP Charlie Angus called on the Canadian Conference of Catholic Bishops to urge Pope Francis to apologize for the Catholic church’s role in residential schools. The motion passed 269-10 in a House of Commons vote. Prix d’excellence (lifetime achievement award), Université du Quebec à Montréal, for his role in the advancement of Cree and Indigenous rights in that province (2003). Hans M. Carlson, Home is the Hunter: The James Bay Cree and Their Land (2003). THE TYEE Romeo Saganash talks to The Tyee about the UN Declaration on the Rights of Indigenous Peoples (2016). PODCAST Listen to Saganash on an episode of Red Man Laughing, an Indian and Cowboy podcast (2015).